Scientists from Trinity College Dublin have gained key structural insights into the machinery employed by opportunistic, disease-causing bacteria, which may help chemists design new drugs to inhibit them. The scientists, led by Fellow Emeritus in Trinity's School of Biochemistry and Immunology, Professor Martin Caffrey, used next-gen X-ray crystallography techniques to 'look under the bacterial bonnet' and produce a molecular blueprint that may be used to design drugs that minimise off-target effects and attack any structural weaknesses. The research, which shows that one key enzyme used in the common bacteria Pseudomonas aeruginosa and Escherichia coli is remarkably similar in structure in both species, has recently been published in leading international journal Nature Communications. These two bacteria opportunistically infect people, and can cause fatalities. Professor Caffrey said: "The structural blueprints of the two bacteria—while very similar—differ in their fine detail. These subtle differences might be exploited to design species-specific therapies with a reduced likelihood for the development of antibiotic resistance." 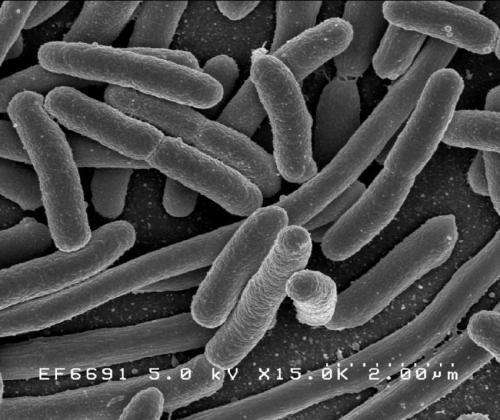 Both Pseudomonas aeruginosa and Escherichia coli are medically important, causing problems in tens of thousands of patients every year. Both are known to have developed resistance to a plethora of first-choice drugs used to treat them. And with antimicrobial resistance on the rise in general, the World Health Organization has advised that a post-antibiotic era, in which minor injuries and common infections could prove fatal, is looming. New drugs are badly needed. However, while the new blueprint of the bacterial enzyme 'Lnt' offers hope for drug development, the process of creating effective candidates is not an easy one. Firstly, similar enzymes are present in humans and other animals, so any drug would need to be sufficiently specific to only affect the bacterial enzyme. Secondly, the biological structure of any drugs that would bind to the bacterial enzymes and inhibit them is likely to be similar to the structure of molecules that inhibit the innate immune response. In other words, stopping the bacteria in its tracks may also slow the body's natural response to infection. Speaking about the difficulty in designing 'silver-bullet' drugs that could turn the tide, and about the next steps in his team's work, Professor Caffrey added: "The structural blueprints generated as part of this study provide a basis whereby the differences between the bacterial enzyme and the immune response proteins might be exploited with the goal of producing a drug that only hits the bacterial target."